First of all when I walk up to someones door I look like I own my own painting business because I have my painters pants on and my estimating tools. I'm also clean shaven and neat in appearance. Also having a decent painting truck helps but it is not necessary when first starting out. When I first started painting I worked out of my beater Oldsmobile that was a big old boat. A 1979 98 Regency. People didn't seem to care or even notice what I drove. They just wanted painting done and my prices back then were cheaper which they loved. That's all you really have to do to get established is to look like you're ready to do some painting with your painter's pants on and some basic painting tools to get started with. You don't need any specialize literature or forms. In time you'll have your own painting truck and and the most important part of all you will have some good quality referrals from satisfied customers. This is what will get you a lot of work plus instant credibility. Don't forget that you'll also get repeat business from your existing customers. Some would lead you believe that you need a lot of special paper work or forms to run a painting business. I basically use one special form and that is for estimating. I use this form to do commercial and residential painting. I like to keep it all simple. Painting is just like any other small service business. You learn as you go. There are speed tips and tricks to the trade just like any other trade. There are painters that shouldn't be painters because their work is really bad. The secret to a successful painting business is to find yourself a reliable painting business partner and then do quality work for people together. You can work alone but there are many advantages to having a partner of two like turning your jobs faster. If you enjoy your work you'll never work a day in your life. I remember looking forward to Monday mornings sitting in Sunday school before church. I could hardly wait to get started on Monday morning on that new project I just got a down payment on. I love to paint I love doing restoration work and every day goes by super fast because I love what I do. There's is nothing better than being self-employed. You don't have to worry about being laid off, you can make as much money as you dare to dream and there is no boundaries or ceilings on your abilities or opportunities. There are a lot of great additional service to add to a painting business also like faux painting, window washing, drywall repair, bathtub refinishing, light carpentry work, etc. These can all be added on a little bit at a time if need be. Again you'll gain instant credibility if you just look like a painter. You don't need a fancy paint truck in the beginning although it does help tool-wise. It will all come together in time. Just a few basic tools and a desire to own your own business is the big issue here. When I first started painting I did not know how to estimate. My first commercial job scared me to death and it was a simple job. One thing that really helps you to gain instant credibility is to have your confidence up. 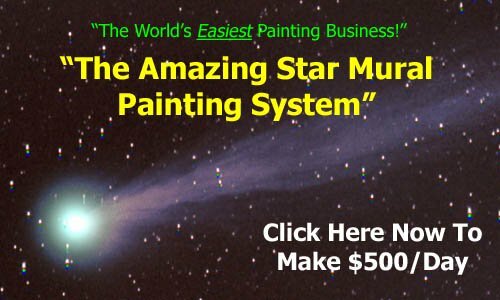 You can do this by knowing how to estimate your painting jobs. I can go in and estimate an interior or exterior job in a relatively short period of time and I look like I know what I am doing. And when I walk away I have confidence and I know that I did a good painting estimate and that I will make money. Getting all the techniques and tricks of the trade down is something you learn a little bit from each job. In time you will be able to master things like drywall repair, the fastest ways to get your prep work done, your own quick system for painting a room, painting windows and doors, etc. Many people make starting a painting business look difficult because they get a case of what is called "detail-itis" (the failures disease). When a project comes along and I am uncertain how I am going to get it done I don't worry about it because the answers fall in place as I do the work. 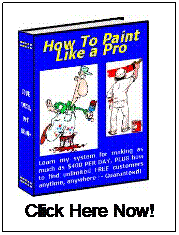 Looking for more painting business tips? Thanks for visiting and click here for more information.